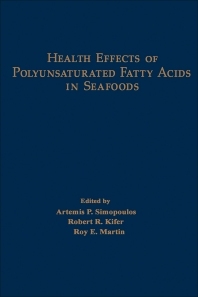 Health Effects of the Polyunsaturated Fatty Acids in Seafoods emerged from the 1985 Proceedings of a Conference on Health Effects of Polyunsaturated Fatty Acids in Seafoods held in Washington, D.C., spearheaded by the National Fisheries Institutes of Health (NIH), the Department of Commerce (DOC), and the National Fisheries Institute (NFI). The conference aims to review the data about the health effects of polyunsaturated fatty acids in seafood; the impact of omega-3 fatty acids on eicosanoid formation, thrombosis, and inflammation; and the role of docosahexaenoic acid in membrane function and metabolism. It also encourages the researchers to study the possible origin of the health effects of seafood in the American diet. Composed of seven parts, the book begins by discussing the summary, conclusions, and recommendations the chairman of each working groups presented during the conference. It also explains the effects of fatty acids on lipoprotein and generation of products of the 5-Lipoxygenase pathway and the membrane functioning and metabolism. Moreover, it discusses the status of the fishery industries worldwide, the different classes of lipids that contain fatty acids, and recipes with seafood as the main ingredient. This book will be of great interest to the scientists such as basic researchers, clinical investigators, and epidemiologists, as well as to health personnel and consumers.